Bought the product(3GB model) on 3rd Jan 2017 from local store for Rs.13500. I haven&apos;t experienced any major problems like any heating or lags. I love the battery life of this mobile,it usually last for a day on moderate usage. Lenovo had really improved a lot in terms of the camera quality. I have been the fan of Lenovo&apos;s sound output but was little disappointed in comparison with k4 notes sound quality which was really awesome. I would not recommend this product to anyone. Initially it&apos;s remunerative but in the long run it fails to satisfy the needs of a user. For example, within weeks I had a problem with the display and the service centre was not of much help because the very next week there was some other problem. The device lags a lot and ever since I have bought it, it has given me a tough time. Do not buy this mobile phone as it is a sheer waste of money. I purchased this phone a year back from Lenovo showroom. I have not really found alot of problems except its sound quality as compared to note 4. Lenovo K6 note has a good battery life. The camera quality is also good. Sound output is amazing. Battery life is also incredible. The phone has a beautiful and attractive design. If you are looking for a good value budget phone, this is the best phone for you. The phone has a very stylish look and a decent camera quality. The battery life of the phone really stands out. The only reason it gets 4 stars is because it is an extremely cheap phone. It delivers all the functions on a good phone at a low price but that does mean that the quality is quite obviously compromised. If it wasn&apos;t this affordable i would&apos;ve rated it much lesser. 7 Pricebaba users have written their experience with Lenovo K6 Note. If you own Lenovo K6 Note, please do leave your feedback too. Lowest price of Lenovo K6 Note price in India starts at Rs. 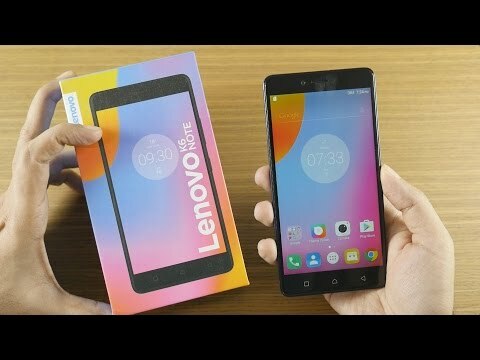 8,235 Lenovo K6 Note is available on Flipkart at Rs. 8,490 and on Amazon at Rs. 8,235. Prices updated on 21st April 2019. Lenovo K6 Note is a dual SIM device that was launched in September 2016. Completely metallic body, fingerprint scanner at the back, good quality of sound by Dolby Atmos, huge storage and very good battery capacity are its major highlights. Lenovo K6 Note comes with 5.5 inch LCD full HD IPS touchscreen display, Gorilla Glass 4 screen protector, and 1920 x 1080 pixels resolution and 401PPI pixel density. It is available in Dark Gray, Silver and Gold colours. It has a capacitive screen with the multi-touch facility. This dual SIM device is loaded with 1.5GHz octa-core Qualcomm Snapdragon 430 processor, 3GB RAM, Android 6.0 Marshmallow operating system and Adreno 505 graphics. Accelerometer, E-compass, gyroscope, light sensor and proximity sensor are in-built. FM radio and GPS are available. Lenovo K6 Note is built with a 16MP rear camera with Sony IMX135 CMOS Sensor and 4616 x 3464 pixels image resolution. It has an 8MP front camera. Camera features include geotagging, autofocus, dual tone LED flash, exposure compensation, face detection, HDR, digital zoom, ISO control and panorama. Users can record full HD videos at 1080p. It has an internal storage of 32GB that can be expanded up to 256GB by using a micro SD card. This dual SIM device comes with a non-removable Li-ion battery of 4000mAh. Users can enjoy connectivity through 4G LTE (India Compatible), 3G, 2G, Wi-Fi, GPRS, EDGE and Bluetooth. It can take two SIMs with 4G LTE connectivity. Ans: Yes, this phone supports VoLTE and will work with Reliance Jio. Ans: Yes this phone has a hybrid second slot. Ans: You will need a standard Micro USB charger to charge this phone. 4. Will this phone get further software updates of Android? Ans: It is unsure whether this will get any future software updates. Ans: The phone has an 8MP front camera so you should be able to click good selfies with it.